Dehydrated skin is what I battle with on a daily basis, but also if you don’t suffer from dehydrated skin your skin sometimes just needs a hydration boost. It’s like a plant, it needs water once in a while to help it grow and glow. Luckily there are some amazing products out there that can help add that extra hydration and quickly. A quick fix if you like. These are hydration boosters and I have been trying out a couple. 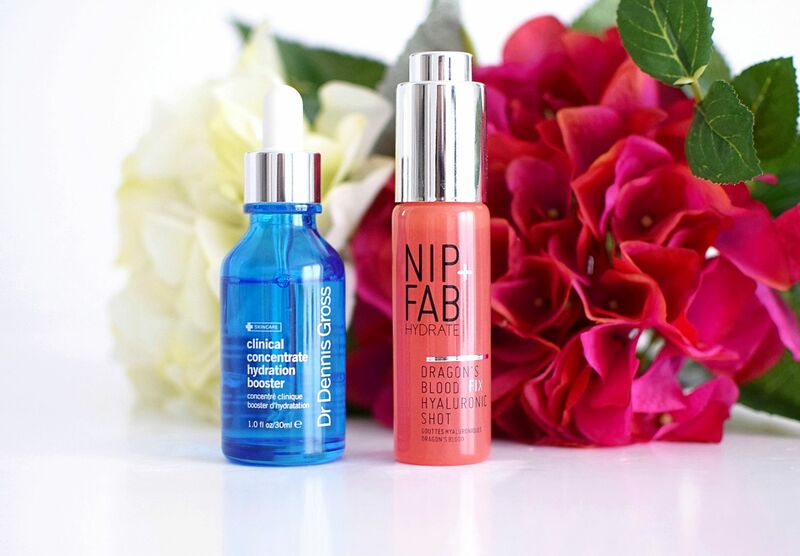 I picked up Dr Dennis Gross Hydration Booster in Sephora in New York and then also more recently trying out Nip & Fab’s Dragon’s Blood Hyaluronic Shot. I’ll start off with Dr Dennis Gross. I am a massive fan of Dr Dennis Gross and his Ultra Daily Facial Peel’s. So when I was greeted with a whole shelf full of products in NYC I knew I had to try something else. I was torn between the cushion moisturiser and this. I went for this as after trying it out on my hand it just felt amazing and I do think serums and oils seem to work better on my skin than creams. The Clinical Concentrate Hydration Booster £59 is a serum that is just packed with so many awesome ingredients to keep dehydrated skin at bay. These include hyaluronic acid, evening primrose oil and coconut fruit juice to hydrate and smooth as well as watermelon extract to protect against free-radical damage from the environment. This can be used AM and PM and in so many ways. I used this straight away when I was in New York and in just the few days I was there, I noticed such a difference from using this product morning and night. I used it all over my face and then applied my usual serum or moisturiser. But you can also add a few drops to your moisturiser using the dropper or add it to your foundation, which I also tried and the results are amazing. It’s best to keep skin hydrated throughout the day more so than in the evening. I am so prone to putting on as much moisturiser as possible at night, but it’s actually better to keep your face more hydrated throughout the day and let your skin recover at night and build up it’s natural oils again. I have nothing bad to say about this product at all and I now use it everyday. 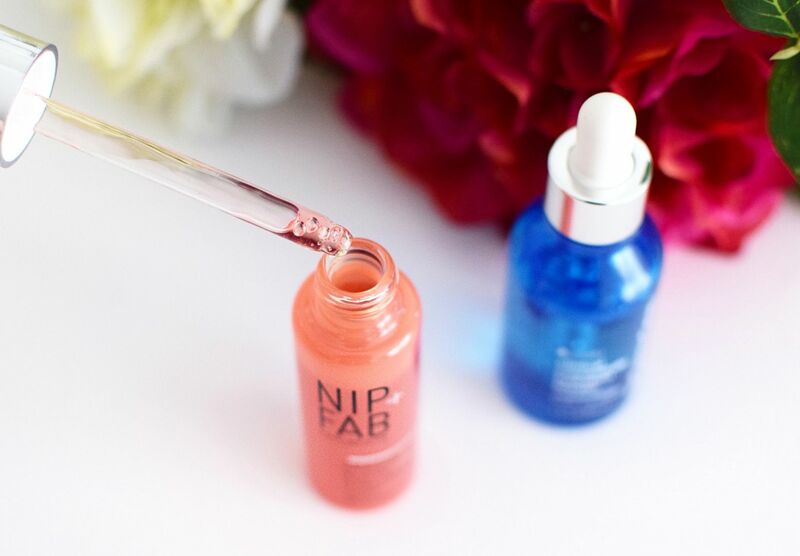 So after trying Dr Dennis Gross, when I got back from New York I was also sent Nip & Fab’s new Dragon’s Blood Hyaluronic Shot £24.95, which includes 50% hyaluronic solution. After getting on so well with the Dr Dennis Gross I was intrigued to try this one out as I do really love Nip & Fab skincare and it has always worked well for me. This one works in a similar way and recommends a couple of drops to transform skin from feeling parched. It also promises a plumper complexion, which naturally would come from your skin being more moisturised. The hyaluronic solution locks moisture into the skin and the dragon’s blood comforts and restores through skin hydration and provides the skin with a shield to protect against environmental damage and also helps to motivate cell regeneration. I found this one also worked well for me and helped my skin stay hydrated throughout the day. The only thing slightly off-putting me from this one is the smell, I’m just not a fan of the fragrance. It’s hard to tell the differences between these both as they are quite similar and I don’t have exact amounts of the ingredients. However with Dr Dennis Gross you have ingredients like primrose oil, coconut oil, glycolic acid and lactic acid as well as many fruit extracts. Whilst looking at Nip & Fab the main ingredient would be the hyaluronic and dragon’s blood which is a sap found in the Croton lechleri tree in the Amazon. I’ve tried both for a while and I think DDG slightly pips the post for me, it just seems to leave my skin feeling hydrated and happy. Will you be trying out a hydration booster?